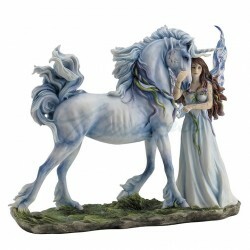 Highly detailed fairy and white unicorn statue by Jody Bergsma. Delightful and colourful heavyweight figurine display piece, artists' signature engraved on the base. H: 24.5cm (10 inches) L: 31.5cm (12.5 inches). Base dimensions: 30cm x 9cm.